The Diebold Memos' Smoking Gun Volusia Co.
"DELAND, Fla., Nov. 11 - Something very strange happened on election night to Deborah Tannenbaum, a Democratic Party official in Volusia County. At 10 p.m., she called the county elections department and learned that Al Gore was leading George W. Bush 83,000 votes to 62,000. But when she checked the county's Web site for an update half an hour later, she found a startling development: Gore's count had dropped by 16,000 votes, while an obscure Socialist candidate had picked up 10,000--all because of a single precinct with only 600 voters." "If you strip away the partisan rancor over the 2000 election, you are left with the undeniable fact that a presidential candidate conceded the election to his opponent based on [results from] a second card that mysteriously appears, subtracts 16,022 votes, then just as mysteriously disappears." Working in parallel with Ms Harris, Scoop has also been inquiring into the events on election night in Volusia county. Much of the material that follows is similar to that which appears in Chapter 11 of her book. The starting point in this shocking discovery about election 2000 came in a series of internal Diebold ES technical support memos. The following is an abbreviated version of the exchange concerning the peculiar events in Volusia county. For the purposes of research the exchange is included in full as an Appendix to this report (APPENDIX TWO). The discussion took place in early 2001 as an audit was underway in Volusia county into the events. * The technical managers at Diebold Election Systems considered it a reasonable possibility that the second card was part of deliberate conspiracy to rig the election results. In her book Bev Harris explains the issue of whether the card was a chance fault or a deliberate example of tampering"
"A memory card is like floppy disk. If you have worked with computers for any length of time you will know that a disk can go bad. When it does, which of the following is most likely? In an Excel spreadsheet that you saved on a "bad disk," might it read a column of numbers correct the first time: "1005, 2109, 3000, 450..." but the second time, replace the numbers like this: "1005, 2109, -16022, 450..." Or is it more likely that the "bad disk" will...fail to read the file at all, crash your computer, give you an error message, or make weird humming and whirring noises." source: page 239, Chapter 11, "Black Box Voting in the 21st Century"
However officially, as we learned earlier, the explanation given publicly -- and accepted without demur by the media -- for the strange events in Volusia county is that there was simply a "faulty memory card". The "faulty memory card" explanation is also included in a CBS News Network investigation into the Election 2000 debacle. And it is here that we find a considerable amount of information about just how significant the Volusia County events were on election night. The first thing we learn from CBS's investigation into the events of election night is that according to the Voter News Service (VNS) exit polls for Florida Al Gore should have won comfortably. 9:54 PM: The CBS News Decision Desk recommends that the call in Florida for Gore be withdrawn. CBS is in a local cutaway at 9:54 PM (the seven minutes at the end of the hour when local stations broadcast their own election results), and so CBS does not withdraw the call until 10:00 PM. 10:16 PM: VNS retracts its Florida call for Gore. The CBS timeline then jumps forward four hours to 2am EST. By now an apparently substantial lead of 29,000 votes has opened up in favour of George Bush. What the news networks and the Al Gore camp do not realize at this point in the evening is that over 24,000 of votes that make up this significant lead are attributable to two Diebold Election Systems computer errors. First there are the 16,022 votes stolen from Gore in Volusia county by the "faulty memory card". Meanwhile over in Brevard County another error - also involving Global Elections System (the predecessor of Diebold) equipment is responsible for a further 4000 votes being lopped off the Gore total. And it is also worth noting that nobody knows whether the Brevard and Volusia county errors were the only ones in play at this time. These errors were both big ones. They were noticed and corrected on the night. How many smaller vote subtractions could have taken place on the night? Theoretically hundreds. As Dana Milbank's Washington Post report shows it was only because someone noticed the error in Volusia that it was corrected and remarkably the software itself contains no automatic system for rejecting negative vote totals being reported by precincts, events which by definition can only be nefarious and wrong. At 2am another VNS error came into play. VNS's estimates of the outstanding votes underestimated those that remained to be counted by half, around 180,000. The two errors combined led news executives at CBS to conclude that Bush's final winning margin in Florida would be around 30,000 votes. At this stage Bush had a lead of around 50,000 votes and late reporting precincts were expected to pare this back as many of them were in Democrat leaning counties. At 2.16am Fox and NBC called the race to Bush, unaware that the Volusia error had now been discovered. Over at Associated Press - the news service that Network News controllers do not read - the margin to Bush had by now fallen to 30,000 after correcting the Volusia error. At 2.17am and 2.20am the remaining two major networks CBS and ABC called the race to Bush. Their decision continued to be bolstered by the VNS data stream - which even at 2.47am - was still recording a margin to Bush of close to 50,000 votes. Remarkably it was not till 2.51am that VNS fixed the Volusia error in its data. Meanwhile with all the networks showing the race for the White House won by Bush, the pressure is mounting on Gore to concede. In the book, "Too Close to Call" by journalist Jeffrey Toobin, the author gives a behind-the-scenes account of how Gore reacted when the television networks concluded that Bush had taken Florida. "Al Gore happened to be in the staff room on the seventh floor when the votes spiked up in Bush's favor. Dressed casually, the vice president was watching television while lying on the floor, with his chin propped up in his hands. As a result of the Volusia votes, Fox News called Florida-and the presidency-for Bush at 2:16 a.m. CBS and NBC followed suit a minute later and ABC came in at 2:20 a.m.," Toobin wrote in his book. "Following the news reports, Gore was silent and absorbed the news. A moment later he told members of his campaign that he was ready to concede the election to Bush, which he did several minutes later over the telephone. "Unwilling to take the television networks reports at face value, one of Gore's campaign staffers did a little investigating and discovered that the networks erred in stating that 50,000 votes from Volusia county were cast for Bush. Turns out that Gore was ahead by 13,000 votes in Volusia and trailing Bush by 6,000 votes overall. Something was wrong in Volusia it would be revealed later. One of Gore's campaign advisers then checked Florida's law on recounts. The nearly dead heat between Bush and Gore in Florida and the fact that Gore was ahead in Volusia County meant a mandatory recount. It was time to rescind Gore's concession to Bush and scrutinize the ballots. Gore was traveling in a motorcade en route to deliver a concession speech to his supporters. His staff stopped him. At this point, the margin between Bush and Gore was down to 2,000 votes. A recount was all but certain." Gore called Bush and Gore's staff surrounded the vice president to listen in on what would become a historic conversation at 2:30 a.m. "Circumstances have changed dramatically since I first called you," Gore said to Bush, Toobin wrote. "The state of Florida is too close to call." "Are you saying what I think you're saying?" Bush asked according to Toobin. "Let me make sure that I understand. You're calling back to retract that concession?" Gore sensed an annoyance in Bush's tone and shot back "you don't have to be snippy about it." Toobin says Bush then told Gore that his "little brother", Florida Gov. Jeb Bush, had assured him that he won the state of Florida and for that matter the presidency of the United States. "Let me explain something," Toobin quoted Gore as saying in his response to Bush. "Your little brother is not the ultimate authority on this." "You do what you have to do," Bush said and hung up the phone on Gore. When Gore turned around to face his staff they exploded in cheers. It is not till 3.10am that the CBS news controllers notice the huge difference between their numbers and those of AP which by now show the margin to Bush at under 10,000. We also know, thanks to the CBS inquiry report, that by around 3.40am the Gore camp had decided not to concede. Gore Campaign Chairman William Daley rang CBS News President Andrew Heyward in the control room and asked him whether CBS would be reversing its call soon. CBS's Andrew Heyward waited another 15-20 minutes after the phone call before ordering CBS to officially withdraw the call to Bush. And by 4.05am all the other networks had also withdrawn the call. By 4.10am the reported Bush lead in the race had dropped to 1800 votes, and thereabouts it remained until the first recount - albeit the Florida Secretary of State's office website reported the race to Gore on the day after the vote. And it is there that the narrative in this tale ends and the analysis starts. In its internal conclusions about these events the CBS inquiry team found the two Diebold County level errors, Volusia and Brevard, were conclusive in their networks decision to call the race to Bush. You do not get much clearer than that. The record already shows that events of election night 2000 turned on the errors in the Volusia and Brevard vote counts. Both of which occurred on Global Election Systems (now Diebold) equipment. Of course we now know Al Gore did not concede. But had he done so would that have altered what followed? Would there have been the hanging-chad phenomena, the lawsuits over recounts and the recriminations? Most of what is contained in the preceding analysis is well trodden territory. Everybody knows that the TV networks screwed up big time on election night, and the issue of bias at those networks has also been well traversed. What has not been discussed, or even conceived of till now, is that the events that occurred between around midnight and 4am might have been the result not of mistakes but of organised voting fraud. Yet that is precisely what Talbot Iredale and Ken Clark's memos confirm is a distinct possibility, in fact, reading between the lines they suggest it is the most likely possibility. Consider this: How plausible is it that an error such as this - of such magnitude, with no apparent physical explanation, and in one of the few counties still receiving incoming results that late in the night - was really the simple result of a "faulty memory card"? 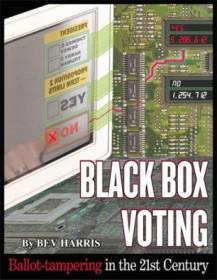 We also now know, again thanks to the work of Black Box Voting investigators like Washington State's Bev Harris and California's Jim March, that the Diebold vote tallying programme used in several Florida counties, GEMS, is easily hackable, both by outsiders and by insiders. We do not know what would have happened had a full state-wide recount been undertaken as the efforts to have one were blocked in the courts. Would they have discovered other counties where unusual events like those discovered in Brevard and Volusia counties? Is it possible that the original VNS exit polling data was closer to being correct? Is it possible that less egregious vote stealing took place in counties all over Florida? Add into the mix the blatant roll scrubbing in Florida discovered by Greg Palast and exposed in his best-selling book The Best Democracy Money Can Buy and you have a recipe of reasons to reopen a full scale inquiries into the Florida debacle. And perhaps more importantly. With paper-less touchscreen voting systems in place in many Florida counties come November 2004, should such events occur again, there will be no record with which to conduct a recount. And the other big mystery of course is this. If someone did try to rig the election returns in Florida in 2000, who was it? As CBS News began its Election Night coverage at 7:00 PM on Tuesday, November 7, Dan Rather pointed out that since Florida wasn't called when a majority of the state's polls closed at 7:00 PM, this would be a tight race. Rather told the audience, "We're waiting on a possible decision in Florida, but you've got time to put on another cup of coffee, and pour it, because in Florida it's generally considered to be so close that it may be a long while before anybody is able to call it." Given what eventually happened, that may have been the wisest comment of the night. But less than 20 minutes later, CBS and other networks called Florida for Gore, and the evening's roller-coaster ride began. Let us review what happened. 7:00 PM: The vast majority of Florida polls close. CBS News decides not to project a winner in the Florida Presidential race at poll closing, even though the best estimate, based upon exit-poll interviews from the 45 survey precincts, shows Gore leading Bush by 6.6 points. The Decision Desk decides to wait for some actual votes from sample precincts to confirm the exit-poll results. 7:40 PM: The VNS computation shows a "call" status in the Florida Presidential race. This status means that statistically Gore is leading, but the Decision Team needs to check more data. 7:45 PM: The CBS News Decision Team begins an intensive review of the state exit polls and the trickle of actual votes in the sample precincts. The CBS News analysts look at the calculation that compares the exit-poll results with the actual votes in the same precincts. The CBS News Decision Desk is aware that two years ago, in the VNS survey of the Jeb Bush race for governor, exit polls underestimated the Bush lead. This year, the exit poll is overstating George W. Bush's vote in the first precincts to report. The analysts had noticed a similar overstatement earlier in the evening in the Kentucky exit poll. Now the analysts examine the actual vote of the 4 percent of precincts statewide that have reported at this time. Although the tabulated vote shows Bush with a 6-point lead, they see this as an early aberration, the result of absentee ballots that had been entered into the system early in the evening. The absentee vote was expected to favor Bush, so the analysts do not consider this one-time occurrence to be representative of the vote to come. Later, this judgment proves to be incorrect. The CBS News Decision Team also notes that the standard margin of error on the estimates is small enough to make the probability of a Gore win fall within CBS News guidelines for a call. 7:48 PM: NBC projects Gore the winner in Florida. 7:50:11 PM: CBS projects Gore the winner in Florida. 7:52:32 PM: VNS calls Florida for Gore. * Estimate of the Absentee Vote. Absentee voters tend to have different demographic profiles and often vote differently than Election Day voters, making it difficult to account accurately and completely for absentee votes in the models. As the size of the absentee vote increases, so does the potential for error in the estimates. The model had estimated the size of the absentee vote at 7.2 percent. In fact, it turned out to be 12 percent of the total Florida vote. The model also assumed that the absentees would be 22.4 points more Republican than Election Day voters. They turned out to be 23.7 points more Republican. * Sampling Error. The results of the exit poll normally vary from the actual tabulated vote by a small amount ("sampling error"). A large difference between the exit-poll results and the tabulated vote for that precinct would suggest the possibility of interviewing problems. The amount of this error in Florida fell within the normal range for an exit poll, although it was at the high end. However, the exit-poll sample itself, even after the actual vote totals from those precincts were examined, was also more pro-Gore than the state as a whole. * Past-Race Comparisons. One of the most important ways that VNS models form estimates of the vote is to compare current exit-poll data and tabulated votes with data from past elections. Throughout the night, the 1998 Florida gubernatorial race was used as the past-race comparison. However, had the model used a different past race (either the 1996 Presidential election or the 1998 Senate race), it would have produced a more accurate estimate. * Distortions Caused by the Time of Reporting. At 7:50 PM, there were only six precincts with both exit-poll data and actual reported vote. The estimate of the average error within those precincts suggested that the survey was actually underestimating the Gore lead by 1.7 percentage points, when in reality it turned out later that the exit poll was overestimating the Gore lead by 2.8 points. Miami and Tampa, the areas that had the biggest overstatement of the Gore lead in the exit polls, had reported no actual votes by 7:50 PM, so there was nothing to contradict the distortion in the exit polls. 8:02 PM: By this time, VNS and all its members have projected Gore the winner in Florida. 8:10 PM: The CBS News analysts have been rechecking the Florida race and feel even more confident about the call for Gore, based on the data available at 8:10. 9:00 PM: A member of the CBS News Decision Team notices a change in one of the Florida computations. One of the estimates, the one based solely on tabulated county votes, is now showing a Bush lead. Alerted, the team begins to review Florida and discovers problems with the data. 9:38 PM: VNS discovers the error and deletes the Duval County vote from the system, sending a correction to all members. Gore's total in Florida is reduced by 40,000 votes. 9:54 PM: The CBS News Decision Desk recommends that the call in Florida for Gore be withdrawn. CBS is in a local cutaway at 9:54 PM (the seven minutes at the end of the hour when local stations broadcast their own election results), and so CBS does not withdraw the call until 10:00 PM. 10:16 PM: VNS retracts its Florida call for Gore. 2:00 AM: The CBS News Decision Team tracks the Bush margin in the Florida popular vote. He leads by 29,000 votes in VNS, with some strongly Democratic counties yet to complete their counts. But the AP numbers are telling a different story. The AP independently collects election returns from each county. Since 1:12 AM, AP tabulations show the Bush lead dropping precipitously. But the people on the CBS News Decision Desk are not following the AP reports, nor are they listening to Ed Bradley in the studio talking about irregularities and outstanding Democratic votes in Florida. At 1:43:43, Bradley points to the fact that a third of the vote is not yet in from Dade and Broward Counties, which are Democratic strongholds. At 1:48:10, Bradley says: "Bush ahead by 38,000 votes. And still out there, about 5 percent of the vote is still out, 270,000 votes. So that's a big chunk of votes." Bradley has been getting additional information from the AP wire, as well as from CBS News Correspondent Byron Pitts, who is reporting from Florida that there are a number of counties still tabulating votes, many of them predominantly Democratic. What has not yet been discovered is an erroneous entry from another Florida county, Volusia. Because of a faulty computer memory card, the county has reported votes that are off by thousands. The initial report from Precinct 216 incorrectly subtracts more than 16,000 votes from Gore's total and adds votes to Bush's total. 2:05 AM: Bush leads by 29,386 on the VNS screens, with 96 percent of the precincts reporting. The models project a very small Bush win for the end of the night. But at this time there is still no way to call the race. 2:09 AM: VNS adds Volusia County's erroneous numbers to its tabulated vote. With 171 out of 172 precincts in the county reporting, Gore's vote drops by more than 10,000 while Bush's rises by almost the same amount. This 20,000-vote change in one county increases Bush's VNS statewide lead to more than 51,000 votes. 2:09:32 AM: At almost the same time, Bradley fires off what in retrospect was a warning shot, but one that sails right by the CBS News Decision Desk: "Among the votes that aren't counted are Volusia County. Traditionally they're one of the last counties to come in. That's an area that has 260,000 registered voters. Many of them are black and most of them are Democrat." 2:10 AM: The CBS News Decision Desk begins to seriously discuss calling Florida for Bush. According to the new VNS vote count, Bush is ahead by 51,433 votes, with 5,575,730 votes counted in 97 percent of the precincts statewide. The CBS News Decision Desk looks at how many votes are outstanding in three major Democratic counties (Dade, Palm Beach and Broward). The statistical analysis projects that Bush's margin of victory will remain greater than 30,000 votes even when those counties are factored in. But there is an error in the assumption: instead of the 179,713 votes the VNS model says have yet to be counted, there are in fact about twice as many outstanding votes, many of them absentee ballots from Palm Beach County. Bush's lead in the VNS count includes the 20,000-vote error undercounting Gore in Volusia County and does not include 4,000 additional votes for Gore in Brevard County. These 24,000 votes would have nearly eliminated the 30,000-vote final Bush margin the CBS News Decision Desk has estimated. There would have been no call if these errors had not been in the system. 2:12 AM: In the AP count, Bush's margin falls to 47,854. (But again, the Decision Desk is not checking the AP wire.) 2:16 AM: Fox calls Florida for Bush. The immediate reaction of the CBS News analysts is frustration because the CBS News Decision Desk is within minutes of calling the race itself. The CBS News analysts spend the next 90 seconds confirming the numbers. 2:16 AM: NBC calls Florida for Bush. 2:16 AM: The AP lead for Bush drops by 17,000 votes, to 30,000. This 17,000-vote drop, occurring in only four minutes, is the Volusia County correction. But VNS does not catch the correction until later, and no one on the CBS News Decision Desk is watching the AP wire or listening to Bradley's reporting. 2:16:17 AM: Dan Rather talks with Bradley about outstanding absentee votes and the potentially large number of votes still out in Daytona (Volusia County). 2:17:52 AM: The CBS News Decision Desk calls Florida for Bush, and Rather declares him the winner of the Presidential election. 2:20 AM: ABC calls Florida for Bush. 2:40 AM: VNS is showing Bush with a lead of 55,537, with only 68,579 votes left to be counted. Had the CBS News Decision Desk analysts not made the call at 2:17, they say, they would have made it at 2:40. 2:47 AM: The AP reports the Bush lead down to 13,934. 2:48 AM: VNS shows the Bush lead at 55,449. 2:51 AM: VNS corrects its Volusia error, and Bush's lead drops to 39,606. 2:52 AM: The AP reports the Bush lead down to 11,090. 2:55 AM: With a large report of votes from Palm Beach County, VNS reports the Bush lead down to 9,163. 3:00 AM: Rather tells the audience to stay tuned: "We haven't heard yet from either Al Gore or from the triumphant Governor Bush. We do expect to hear from them in the forthcoming minutes." 3:10 AM: A consultant in the CBS News studio working with Lesley Stahl at the House and Governors' Desk informs the CBS News Decision Desk of the huge drop in the Bush lead, and the CBS News Decision Team begins investigating the numbers. It also begins tracking numbers on the Florida Secretary of State's Web site and from the AP. While the three sets of numbers are different, all of them show that the race has narrowed tremendously. At this time, there is no report from VNS analyzing what has brought about this dramatic change. 3:32 AM: There has been much anticipation during the last half-hour about the expected Gore concession speech. Rather gives a possible and uncannily prescient explanation for Gore's absence: "It wouldn't surprise anybody, least of all your narrator, if Al Gore said, 'You know what? I am not going to concede this thing because it's just too close. I want somebody to get in there and recount those ballots'"
3:40 AM: Bush's lead drops to 6,060 votes. At around this time, but he is not sure exactly when, CBS News President Andrew Heyward receives a call in the control room from Gore Campaign Chairman William Daley. It lasts less than a minute. Daley asks whether Heyward is aware of the dwindling Bush lead and whether CBS News is considering pulling back its call for Bush. Heyward is noncommittal and asks what Gore is planning to do. Daley says, "I'll get right back to you," hangs up and does not call back. There is more talk in the studio between Rather and the correspondents about the peculiarities now emerging in the Florida vote count. They discuss the AP count of the decreasing margin for Bush. 3:48 AM: Rather says, "Now the situation at the moment is, nobody knows for a fact who has won Florida. Far be it from me to question one of our esteemed leaders [CBS management], but somebody needs to begin explaining why Florida has now not been pulled back to the undecided category." He goes on to say, "A senior Gore aide is quoted by Reuters as confirming that Gore has withdrawn [his] concession in the U.S. President race." 3:57 AM: The Bush margin has narrowed to fewer than 2,000 votes. Before the CBS News Decision Desk can officially advise a retraction, CBS News President Heyward, who has been watching the Bush lead melt away and listening to Rather and Bradley discuss the Florida situation, orders that CBS News retract the call for Bush. 4:05 AM: By this time, the other networks rescind the Florida call for Bush. 4:10 AM: Bush's lead drops to 1,831 votes, which is roughly where it remains until the first recount. The call was based entirely on the tabulated county vote. There were several data errors that were responsible for that mistake. The most egregious of the data errors has been well documented. Vote reports from Volusia County severely understated Gore's actual total when a faulty computer memory card reported votes that were off by thousands. That precinct, Number 216, subtracted more than 16,000 votes from Gore's total and added votes to Bush's total. In addition, an apparent reporting error in Brevard County reduced Gore's total by an additional 4,000 votes. There was another problem: the VNS end-of-the-night model uses a straightforward projection of the number of precincts yet to report in each county. It assumes that the outstanding precincts in each county will be of average size and will vote in the same way as the precincts that have already reported from that county. However, at 2:17 AM there were more as-yet-uncounted votes than the model predicted. In fact, in Palm Beach County, a heavily Democratic area, there were three times as many votes yet to be reported as the model predicted. Some of that appears to be accounted for by the late release by county election officials of a large absentee vote. As we have seen above, the first Florida call for Gore was probably unavoidable, given the current system of projecting winners. Early in the evening, the sample that VNS selected to represent voters statewide overestimated Gore's lead, and a call was made for him. As the tabulated vote started accumulating, Gore lost his apparent lead, and a decision was made to take back the call. The ongoing VNS reviews have determined that the exit-poll sample of precincts in this election did not adequately represent the state. The exit-poll sample estimated a significant Gore lead that never materialized. That fact remained unknown until the actual vote count. The sampling data and exit polling did not take into account the 12 percent of the Florida vote that was cast by absentee ballot, which also affected the quality of the data. The CBS News Decision Desk could not have known about these problems. However, the second Florida call, the one for Bush, could have been avoided. It was based, as we have seen, on a combination of faulty tabulations entered into the total Florida vote, with an especially large error from Volusia County that exaggerated Bush's lead. Later, in the early morning hours, reports from large precincts in Palm Beach were recorded, along with a surge of absentee ballots from that county. When the Volusia County numbers were corrected and the new numbers from Palm Beach taken into account, the Bush lead shrank, and a decision was made to take back the Bush call. The call might have been avoided, if there had been better communication between the CBS News Decision Desk and the CBS News studio and newsgathering operations, which had been reporting ballot irregularities and large numbers of potentially Democratic votes still outstanding, and if the VNS vote totals had been checked against the ones from the AP and the Florida Secretary of State's Web site. The AP corrected the Volusia County error 35 minutes before VNS did, and one minute before CBS News made its call. And, despite all the understandable focus on the Florida calls, they were not the only mistaken calls of the night. There are two separate issues/problems that are getting combined in this stream. - a check sum error occurred which the poll worker reset and continued counting the card "did not" require downloading before be reset. She never reran the previously counted ballots and this resulted in some negative PR post election. So that is Lana's primary question, how did this happen? Ken explanation sounds like a good one and will not require a line for VTS if we can ever get to GEMS. - the negative numbers on media display occurred when Lana attempted to reupload a card or duplicate card. Sophia and Tab may be able to shed some light here, keeping in mind that the boogie man may me reading our mail. Do we know how this could occur? PS - this was not the same precinct causing both problems if my memory is correct - Sophie? Tab? [Date Prev][Date Next] [Chronological] [Thread] [Top] Re: Investigation of Volusia's Memory Cards. I guess there are two items that I would like to be able to say to Volusia and other FL Counties. 1) we've put something in place that will prevent a poll worker who gets a "check sum error" from restarting the AVOS unit without going through supervisor functions. What caused all the media hype is that the poll worker was able to reset the unit and hence missed recounting the original ballots. John, I'm taking this to support because these suggestions/questions are something that we all face. 1. If you're advocating a change to the AVOS firmware, you *should* discuss this on the support list and once you (or whoever) have determined how it should be implemented, it should be posted as an RCR. 2. Just to ensure that we're speaking the same language, the term "CHECKSUM ERROR" is from the AVOS audit log report. I would prefer to call this event as "corrupted counters" because, for reasons that will likely never be known, the AV detected that the vote counters stored on the memory card were not in order. In fact the AVOS checks several types of redundancy in the counters and could find a problem even if the sums checked out properly. The user (probably a voter) on feeding a ballot in count mode AFTER the counters have been corrupted would be prompted with "CORRUPT COUNT SEE OFFICIAL" and the unit would return the ballot and stop functioning. The reason that this happens after is that we use some of the time that we're waiting for the ballot to be scanned to run a check of the memory card and so any problem found was probably caused by an earlier event such as the previous ballot. The above forces the AV to be reset (power cycled). If the error was not transient (likely it wasn't because some time ago we programmed it to double check the problem before locking up), then the AV will prompt "COUNTER ERROR OK TO CONTINUE?" and then "CLEAR COUNTERS AND RECOUNT?". One vote center in Volusia quietly did clear the counters but failed to recount the previously processed ballots. If may be entirely reasonable that we would want to prompt for the supervisor password before actually allowing the counters to be reset but I'm not convinced that this would have prevented the situation. It seems that the poll workers there were just doing things on their own and would have entered the password and continued. Maybe not. The critical failing is that they did not report the problem. What do others think? I understand that in election mode this is impossible, we need to make it so for this type of error as well. Hopefully that would not require a certification review. This all occurred in election mode. I think you are trying to say that normally you cannot clear the counters in election mode without using the supervisor password. The current method of handling corrupt counters is an exception to that rule. All firmware and software changes require a certification review, ESPECIALLY IN FLORIDA. Florida does their own state certification review. 2) If we can, we need to be able to tell Volusia why this happened on four different memory cards. Check Sum Errors are rare in my history with Global, even more rare for the customer base I believe . I need a non-techie, in plain English , a few short sentences at most, on why it happened. In Volusia they and the review committee are still waiting on an answer. DELAND, Fla., Nov. 11 - Something very strange happened on election night to Deborah Tannenbaum, a Democratic Party official in Volusia County. At 10 p.m., she called the county elections department and learned that Al Gore was leading George W. Bush 83,000 votes to 62,000. But when she checked the county's Web site for an update half an hour later, she found a startling development: Gore's count had dropped by 16,000 votes, while an obscure Socialist candidate had picked up 10,000--all because of a single precinct with only 600 voters. The aberration was relayed to County Judge Michael McDermott, the election overseer. "We have a problem here," he said. It was the beginning of a week-long tragicomedy of errors in this central Florida county, where an initial count showed Gore beating Bush by 97,063 votes to 82,214. Volusia's mess is in some ways more damning than the mix-up in Palm Beach County, where controversy has centered on a confusing ballot design. Although there is no evidence that the first round of results was wildly inaccurate, the problems in counting votes here are systemic. The underlying causes are not fraud or corruption, but lax state oversight, inadequate funding, technological glitches, poor training--and general ineptitude. On election night, six precincts couldn't transmit their results because of computer problems, and the county's returns were delayed until 3 a.m. About that time, sheriff's deputies were dispatched to find an election worker who had left the ballot collection area with two uninspected bags. Wednesday, when county officials were attempting a recount in front of TV cameras, an elderly poll worker walked in with a bag full of ballots that had been left in his car the previous night. By Thursday, the elections office was surrounded by police tape, and a local Bush official was thrown out of a meeting for getting too rowdy. Friday, county workers found a ballot bag in their vault without a seal, another with a broken seal and a third on a shelf with ballots spilling out. Meanwhile, dozens of black students from a local college complained they were turned away from polling stations even though they were registered to vote. This morning, 300 county workers and hundreds more party observers converged on county offices for a manual recount of nearly 200,000 ballots that was later postponed until Sunday. The confusion in Volusia, one of four counties where Democrats have requested manual recounts, suggests why such an arduous process may be necessary. But it also suggests that a central argument of the Republicans who tried today to stop the recounts--that they won't resolve anything--may have some validity. "No wonder people in the North think we're a bunch of bumbling idiots--because we are," says James Clayton, a DeLand lawyer--and he represents Bush. "From a practical standpoint, nobody has any faith in the system." Douglas Daniels, a lawyer for Gore here, predicts there will be "television movies about how the election was stolen in Volusia County." He frets that Volusia will become conspiracy theorists' new "Grassy Knoll gunman." Doug Lewis, an election expert who runs the non-profit Election Center in Washington, says many of the troubles in Florida would be found anywhere if a close election were scrutinized. "If anything, the elections officials in Florida live to a higher standard," he said. But told of the happenings in Volusia, Lewis revised his opinion. "If these things are true, this is an exception," he says. "This is one that would embarrass all of us." In some ways that is not surprising. The county, which encompasses Orlando bedroom communities on bustling Interstate 4, Daytona Beach and a growing population of Hispanics and northern retirees, was known decades ago for shootouts, ambushes and stolen ballot boxes at election time. "We have a sordid history of election fraud in this county," Circuit Judge John Doyle wrote in a 1997 ruling. In that case, a challenge to Volusia's 1996 sheriff election, Doyle focused on incompetence, attributing "gross negligence" to election supervisor Deanie Lowe and her canvassing board but allowing the election to stand. They missed about 1,000 votes and illegally re-marked absentee ballots with black markers, among other things. In 1998, Lowe had to re-issue about 1,200 misprinted absentee ballots. And another ballot was found to have violated state law requiring that candidates for nonpartisan office be listed alphabetically. Lowe, in a hurried interview last week, defended the office's performance. "There's no trouble," she said. "Everything humanly possible was done to make sure it was a fair election." Nobody alleges fraud in Volusia, and it's possible the mishaps haven't substantially altered the election's results. As Lowe points out, each of the problems can be explained. For example, it turned out that the election worker who left with two bags was merely taking home dirty laundry. Had the presidential election not come down to a couple of hundred votes in Florida, the troubles here might have gone unnoticed. County spokesman David Byron boasts that a recount found "exactly the same" tally and suggests that this vindicates the county. But the recount he refers to was a comparison between the data in the computer and the computer printout. The actual ballots were not scrutinized. That's a little like saying a word-processing document contains no spelling errors because a printout matches the version on the screen. Although Volusia County is a microcosm of the tremendous changes from growth and suburbanization that Florida has undergone in the past decades, the way it runs its elections seems something of a throwback to its rural past. In the past five years, the number of registered voters in the county has increased 28 percent, from 203,000 to 260,000, but the money to hold elections hasn't grown proportionately. Lowe said she hasn't asked for big budget increases, using a $1 million computer system introduced in 1994 to do more with less. Still, there are problems. "I'd like a new building," Lowe said. As the recounting progressed last week, the elections department was mobbed by sheriff's deputies checking everything--even office supplies--that entered a secured area for signs of stray ballots. When 20 boxes of Hungry Howie's pizza arrived for lunch Friday, Phil Giorno, the Democratic county chairman, teased the cops: "Did somebody check those?" Finally on Friday, election officials had to relocate the recounting operation to other county offices across the street. While the nation waited for Volusia's results, men piled the 300 ballot bags on a truck under the supervision of guards, witnesses and McDermott, who joked that after all the years he spent on the bench, "now I'm telling people how to load a truck." Though Lowe insists funding isn't an issue in Volusia, the Election Center's Lewis says money is a particular problem in poorer areas and those experiencing large growth, where infrastructure and police get priority over elections. Training also seems to be an issue for Volusia's 2,000 poll workers. That was underscored when poll worker Gene Tracy, 79, walked into the election office Wednesday explaining how a bag of ballots was left in his car. "I about had a cotton-pickin' stroke," he told a local reporter. "I hollered for my wife and I said, 'The dadburn ballots are still in the car.' "
Technology is also a problem. Though Volusia's new system (in which ballots are marked with a felt pen and put in a scanner) is superior to Palm Beach's baffling ballot, faulty "memory cards" in the machines caused the 16,000-vote disappearance on election night. The glitch was soon fixed. Also, Volusia secures ballots in blue canvas tote bags, sealed with tape that keeps popping off. Its fancy system also has a problem accepting damaged absentee ballots. But both sides here blame human error, and particularly Lowe. "She's a nice lady, [but] she's a bumbling idiot," said Republican Clayton. "How do you lose a bag of ballots? She doesn't dot her i's and cross her t's." Democrat Giorno's solution to the mess: "Elect a new supervisor of elections." In fact, the people of Volusia rendered their verdict on Lowe last week--they reelected her. Even McDermott, admired by Republicans and Democrats, seems overwhelmed as chairman of the elections canvassing board. "I'm going to go home and take a nap," he said at lunchtime Friday. "You'll have to be patient with me. I haven't had very much sleep lately." And he's not about to get much soon. Even if the recount ends by Tuesday, he's likely to face more doubts about the process. It turns out Volusia's Bethune-Cookman College, a traditionally black school, held a voter registration drive that produced 2,000 new voters. But a large number--the school says 50; the Democrats say more than 100--claim they were turned away at the polls. "It'll be thrown in the hopper," vows Democratic lawyer Daniels.